A cleansing bath is helpful if you want to sweat out toxins, kick your immune system into high gear when fighting off an illness, and really get your circulation going. 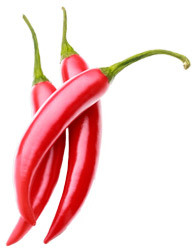 Using heat stimulating herbs like cayenne pepper, ginger and mustard in the bathwater will encourage perspiration. Drinking a deep cleansing tea with yarrow, peppermint and ginger will keep you well hydrated while sweating out toxins in the bath and encourage your body to let go of toxins deep in your body. In addition to greatly stimulating the circulation in the body, a Deep Cleansing Bath with herbs primarily creates an artificial fever. This is beneficial because when the temperature of the body increases, the white blood cells move faster and faster through the body and engulf more and more bad stuff for elimination. Make sure the bathroom is a comfortable temperature before you begin. Run a bath with water that is a hot temperature you are comfortable sitting in. Put the tub soaking herbs in a clean cotton sock, tie the end closed and put in the water, squeezing often to release the herbs. One of the benefits of adding the "hot" herbs is they will continue to help your body release toxins, sweating them out with artificial heat even after the water has started to cool down. Trust me, you will be sweating! The more deep cleansing tea you drink before and while taking your bath, the better hydrated you will feel and the deeper your body will cleanse. If possible, aim for at least 2 cups of tea before getting in the bath and 1 cup while in the bath. Please use something like Vaseline over all sensitive areas of the body that are irritated by heat before getting in the bath. You may only feel comfortable staying in the hot water for a few minutes, by then the sweat should start pouring down. Listen to your body, if you start to feel too lightheaded or uncomfortable from the heat, it's ok to stop your bath and slowly move towards the next step, rinsing off with cool water. When you have reached your limit of comfort in the hot water, you can rinse off the hot herbs with cold water from the shower. Keep in mind you have been raising your temperature with the hot herbs, deep cleansing tea and hot water, take your time with standing up, holding on to something to steady yourself as you get up. Having a bottle of cayenne concentrate on hand can help with feeling lightheaded since it will increase circulation to your head immediately. Just put a few drops of the cayenne concentrate under your tongue, wait a minute and see if you feel more balanced. You don't want to shock yourself too much with the difference in temperature when rinsing off from a hot cleansing bath. While the tub is draining you can start rinsing yourself with lukewarm water from the shower and slowly turn down the temperature of the water until it is cold. This will feel extra refreshing after spending time in a hot tub with sweat pouring off! Spend 30-60 seconds under the cold water, rinsing all soaking herb residue from your skin. Slowly turn the water back up to luke warm and finish rinsing off any leftover Vaseline or other protective substance from sensitive areas. Note: You don't want to use municipal water containing chlorine, etc. as chlorine and other chemicals absorb readily into the body when soaking in hot water and pores are open. If this is the water normally available for you at home, an inexpensive charcoal filter can be obtained from Home Depot type stores for about $30, which fits in place of your shower head. 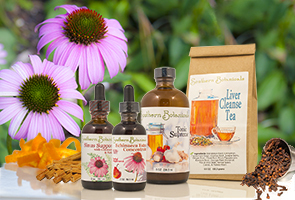 Order Deep Cleansing Bath with organic tub soaking sweat-out herbs here. 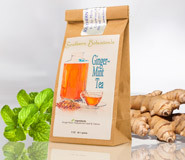 Order organic Ginger-Mint tea here for use with Deep Cleansing Bath.